All dressed in white... Isn't she pretty? 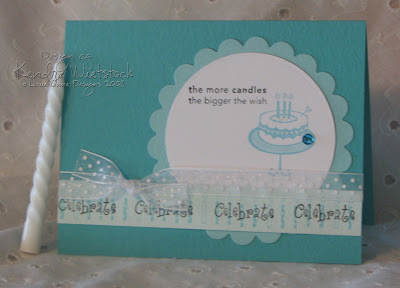 I love the soft blue and white (and sparkle) of this card. 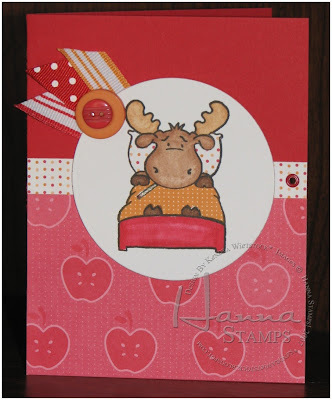 This is a new set from Hanna Stamps that will be released this Friday, July 4th. I'll have more cards using this set later this week. Supplies Used: Stamps ~ Hanna Stamps (Here Comes the Bride); Cardstock, Pattern Paper & Ribbon ~ Aqua Mist by Papertrey Ink; Ink ~ Palette & Copics; Glitter ~ Stickles; Pearls & Flowers ~ SU Pretties Kit; Nestabilities by Spellbinders. Well today we are finally having Matt's birthday party. His birthday was June 10th, but since we were leaving on vacation, we decided to have it after our return. We will be taking Matt and his friends to the local bowling ally for an afternoon of bowling, games, presents and of course, cake. Last week I needed to get the invites in the mail quickly but didn't have time to make them. I ended up sending the ugly postcards the bowling ally supplied. As a cardmaker, I cringed when i dropped them in the mailbox knowing I should have made them better. 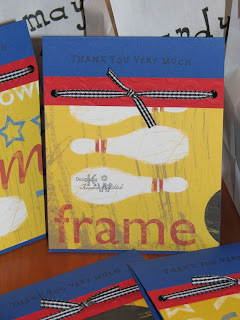 Later that same day, I vowed that I would make some cute gift bags and thank you notes to redeem myself ~ that's exactly what I did later in the week. Supplies Used on Gift Bags: Cardstock ~ SU; Pattern Paper ~ Scrappin' Sports & More; Ink ~ Palette; Stamps ~ SU; Stickers ~ Mrs. Grossman; Ribbon ~ SU. Supplies Used on TY Note: Cardstock ~ SU; Pattern Paper ~ Scrappin' Sports & More; Ink ~ Palette; Sentiment Stamp ~ Hero Arts; Eyelets & Ribbon ~ SU. Yesterday I showed you the entire group picture, so today I wanted to show you the shot we got of jut the four of us. We decided to get more pictures taken on the second formal night & I was very happy with the result. You'll probably see this picture again on a scrapbook page (or project) and maybe even our Christmas card this year. Matt was in a "mood", but I still like how it came out. In addition, I love to buy the pictures they take when you get on for the first time & when you get off at each port. 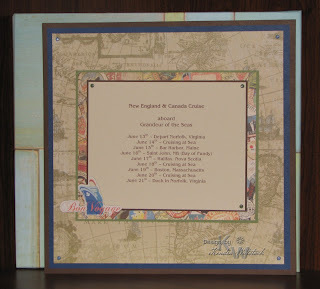 It's a great way to document your trip in a scrapbook. So here we are at our favorite port. Don't worry, it's back to projects tomorrow. I have been working hard the past 3 days on posts for the upcoming week! I've been stamping a bit since I've been home; however, today I thought I'd share some picutres from our trip last week. It was a wonderful time to spend with Tim's family. His parents are some of the most wonderful people in my life ~ I just adore them. We have traveled with them many times & we just enjoy laughing together. I am very blessed to have such wonderful in-laws! Before the trip even started I told everyone that we had to get at least one good picture of all of us together. I was very pleased with how this shot turned out on formal night. Everyone had their eyes open and a smile on their face ~ woohooo! 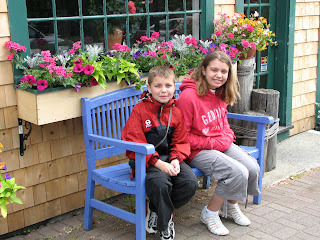 This second picture was taken in Bar Harbor, Maine, which was our favorite stop on the trip! It was a beautiful town with fun shops, lots of great food and home to the gorgeous Acadia National Park. Can't you just smell the yummy cupcakes Riley is serving up? I love the smell of fresh baked goods. I enjoy baking ~ I'm actually a better baker than a cook. Maybe because I like to cook with exact measurements & that is required for baking. My husband on the other hand, would rather throw in a bit of this and a pinch of that ~ he is a much better cook. Then add 1 c. chocolate chips, mix & set aside. To the flour mixture, add 1 c. water, 1 T. vinegar, 1/3 c. oil & mix together. 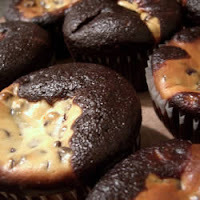 Fill paper cup liners 1/3 full with chocolate cake mixture and then place a spoonful of cheese mixture on top. Sprinkle with sugar and nuts (if desired). Bake at 350 for 30 minutes. Makes 24 cupcakes. Supplies (for the card): Stamps ~ Hanna Stamps (Riley Collection); Cardstock ~ Prism & Papertrey Ink; Ink ~ Palette & Copics; Pattern Paper & flower brad ~ The Paper Company; Ribbon ~ Stampin' Up! 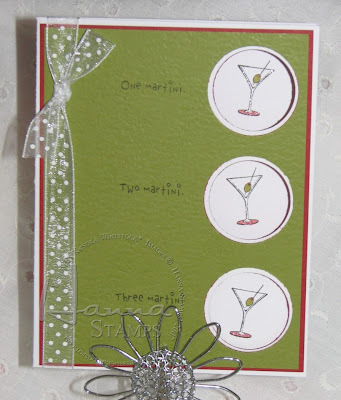 ; Nestabilities by Spellbinders. Well it looks like Riley missed a few apples because he isn't feeling that great today. 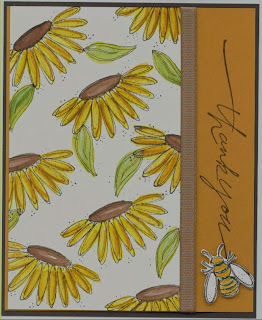 This is part of the new Riley release now available at Hanna Stamps! I'm sorry my posts are so short lately. I'm just trying to get back into the swing of things right now and I have lots to catch up on. I'll share some photos and journaling from my trip very soon. Supplies Used: Stamps ~ Hanna Stamps! 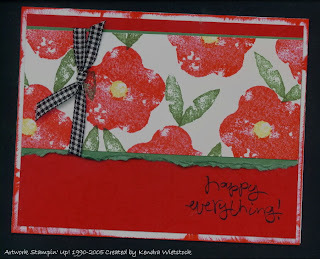 ; Cardstock & Pattern Paper ~ Stampin' Up! ; Ink ~ Palette & Copics; Ribbon ~ SU & Bo Bunny; Buttons ~ Basic Grey; Nestabilities by Spellbinders. I'm home! We had a great trip & Tim's parents were thrilled to have everyone there with them. It was a very special time. So now I have another new Riley to show you ~ isn't he cute? I worked on him today & boy was it hard to get back into the swing of things. I enjoyed having some time away, but I think it's going to take me a few days to get back into my stamping groove. All of these new Riley stamps are now available at Hanna Stamps! 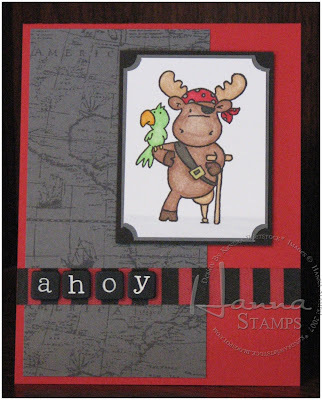 Supplies Used: Stamps ~ Hanna Stamps (Riley Collection); Cardstock ~ SU; Ink ~ Palette & Copics; Ribbon ~ Karen Foster Designs (Pirate); Alphabet ~ Doodlebug Tiles. Nooooooooooooooooooo...NOT SNOW!!! Well, maybe just for Riley. 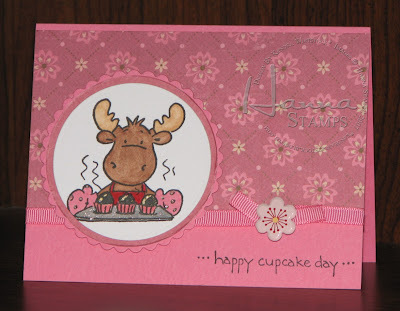 I have to say, it was hard making this card right now ~ But, I do think this Riley stamp is adorable! In fact, it may be my favorite of the bunch. Supplies Used: Stamps ~ Hanna Stamps ( Riley Collection & Hanna Tis' the Season) & Lizzie Anne Designs (sentiment); Ink ~ Palette & Copics; Cardstock, Pattern Paper & Ribbon ~ SU; Buttons ~ SEI. Another new Riley from the fall/winter collection. These images are so much fun & great to color with my Copics! New Riley Stamps are Here! And he's back in school! 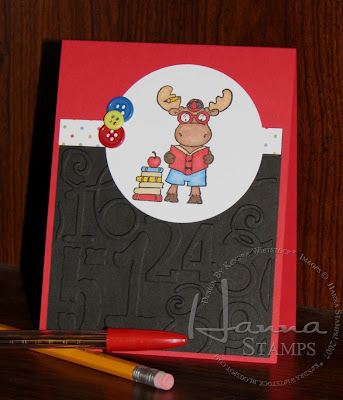 Last night, Kristi from Hanna Stamps, announced a new set of Riley Moose stamps coming out. They are the fall & winter collection ~ I know it's summer, but you have to admit these guys are cute! Go blog hopping on the design team blogs to see more of the collection. 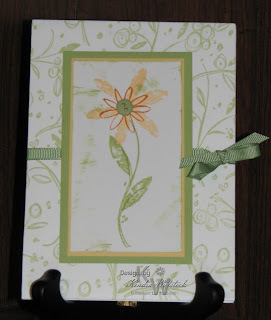 Supplies Used: Stamps ~ Hanna Stamps (Riley Collection); Cardstock & Pattern Paper ~ Stampin' Up! 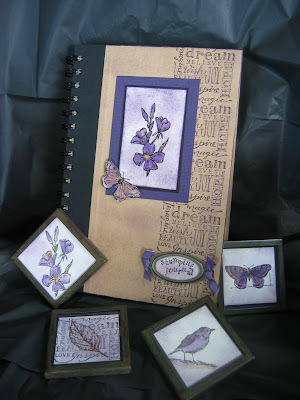 ; Ink ~ Palette & Copics; Cuddlebug Embossing folder; Nestabilities by Spellbinders; Buttons ~ Dress it Up. Vacation Update: We docked this morning in Norfolk & will be driving home today. So today I have a new Lizzie Anne Card to show you. It was for my June assignment for the Design Team. This super cute set is simply called Happy Birthday. 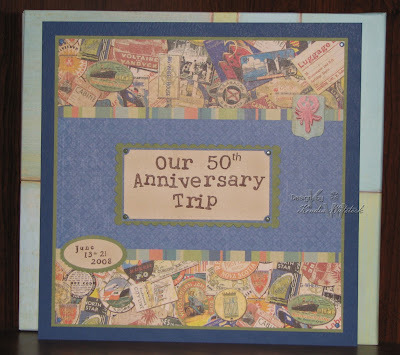 Supplies Used: Stamps ~ Lizzie Anne Designs (Happy Birthday); Cardstock ~ Prism; Ink ~ Palette Noir & Stampin' Up! ; Ribbon ~ May Arts; Nestabilities by Spellbinders. Vacation Update: Today is our last full day at sea. After a full week of activities, we will enjoy lots of relaxing by the pool, playing games, and reading. It's gonna be a LOW KEY DAY! This was a fun little project. 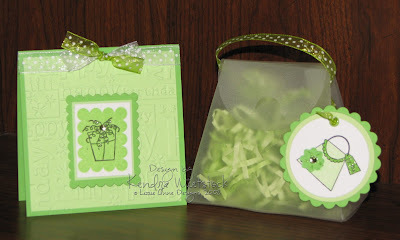 I actually recycled the little plastic bag from some die cuts I won a few years ago ~ I knew I saved it for a reason! It's the perfect size for a bracelet or a pair of earrings. 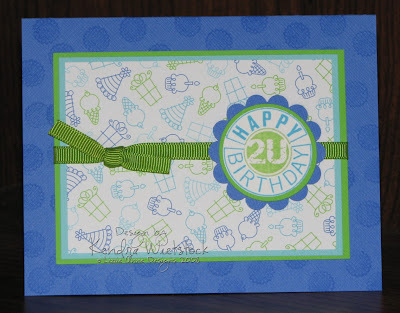 Supplies Used: Stamps ~ Lizzie Anne Designs (Happy Birthday); Cardstock ~ Stampin' Up! ; Ink ~ Stampin' Up!, Palette Noir & Copic Markers; Nestabilities by Spellbinders; Cuddlebug embossing folders; Flower Punch ~ Stampin' Up! ; Jewels ~ K & Co.; Ribbon ~ May Arts. Vacation Update: Today we are in Boston, Massachusetts. We are planning on taking a Historical Walking Tour & can't wait to see the sites. THEN...I will be meeting up with my sweet friend Heather (Hooty as we call her) for lunch and a visit. Can't wait to get some Shistah Hugs! Yes ~ You have seen this something like this recently. I loved the thank you card I made with all the LAD sentiments, so I just had to make a birthday card to match. I was so stuck on the colors that I didn't even change them. 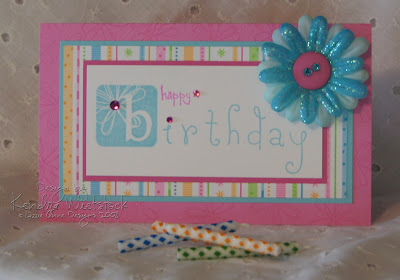 Supplies Used: Stamps ~ Lizzie Anne Designs (Happy Birthday, Sketched Sentiments); Cardstock, Ink & Punches ~ Stampin' Up! Vacation Update: Hmmmm....where are we going to be today. Oh yes, crusing south from Nova Scotia to Boston. So today, we have all day on the ship. I'm hoping the waters are smooth sailing. Eventhough I am still on vacation, I do have some current things to show you. Thanks for hanging in there with my Blast from the Past series. It was great fun looking for those projects & I hope you all enjoyed them. 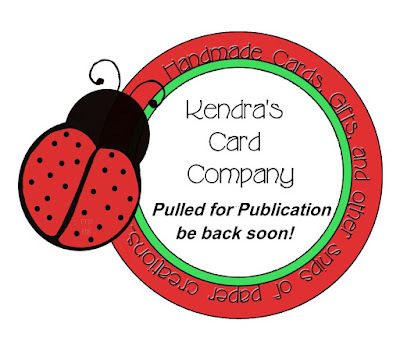 Now on with the current projects... Did you ever have a card in your head and you knew just how you wanted it to look? Then you made it & it turned out just like you planned? Well ... that didn't happen with this card! I've had this card planned in my head for months and it didn't even come close to the cute card I imagined. Oh well ~ what are ya gonna do? 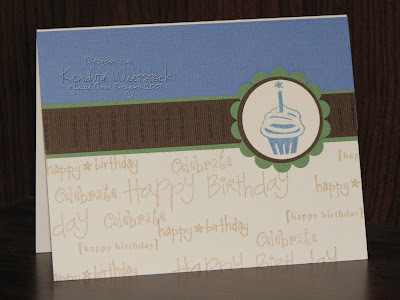 Supplies Used: Stamps ~ Lizzie Anne Designs (Happy Birthday & Olivia Alphabet); Cardstock ~ Stampin' Up! ; Pattern Paper, Flowers, Button & Jewels ~ Doodlebug; Ink ~ Stampin' Up! & VersaMark. Vacation Update: Today we will be in Halifax, Nova Scotia and the plans include a tour of Peggy's Cove Fishing Village, a seafood lunch and a double-decker bus tour. OK ~ this is the last one. But it was fun looking through my old pictures searching for some projects to post. 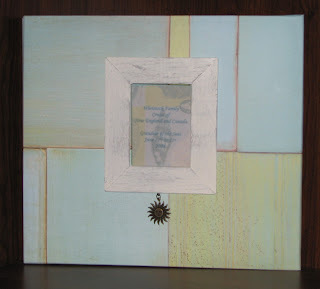 This was a project I made for a raffle prize on Splitcoast Stampers. A group of us made prizes & Splitcoast collected donations to buy a special new bike for Tacy (daughter of Heather Nichols ~ Pine). I just love these notebooks from Target! They turn into fabulous journals for any occasion. Vacation Update: Today we will dock in St. John, New Bruswick & the Bay of Fundy. Our plan is to take a photography tour that came highly recommended. Tim just got a new camera lens and Matt received a new camera for his birthday, so it should be fun to see what kinds of pictures we get. Today we are celebrating my in-laws 50th Wedding Anniversary. For this very special day, we are giving them this album to remember our fabulous trip. Since we don't have any pictures of the trip yet, I just did the cover, the title page and the trip itinerary page. The rest of the pages will be given to them after we return & I have a chance to make them (they should have all 20 pages by Christmas). I could have made some pages ahead of time & plopped pictures down on them, but I really prefer to scrapbook with pictures because you just never how your photos will turn out. The cover has an opening for a photo or a title. I printed this off on vellum from the computer and attached it to a piece of pattern paper. 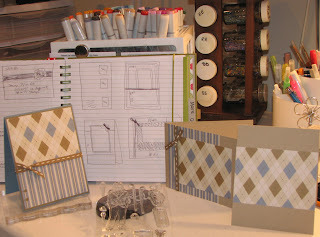 This album, pattern paper and embellishments are from a new collection by K & Company called Sea Glass. I thought it was perfect for this New England trip. Vacation Update: Today we will arrive at our first port ~ Bar Harbor, Maine & will be visiting the beautiful Acadia National Park. We will also have a big celebration tonight at dinner! Happy Anniversary Gladys & Milo! Here are a few more from the old SU set called In Full Bloom. 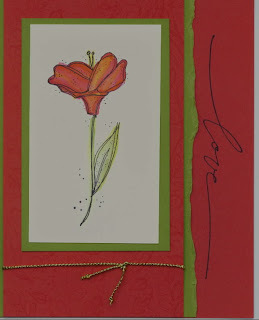 I can even remember when I sat down and made these Black-eyed Susan cards. I even entered the top card in the 4H Fair last year and won 1st place ~ woohoo, a whole $3 prize! Today, we are sailing the Atlantic Ocean. The ship left the port of Norfolk, VA yesterday at 4pm & today will be a relaxing day at sea! We have been looking forward to some time as a family ~ this should do the trick! This was a great swap idea! When this wonderful set called Mixed Bouquet came out 4 years ago (or was it 5 years ago?) ~ I couldn't wait to play with it! 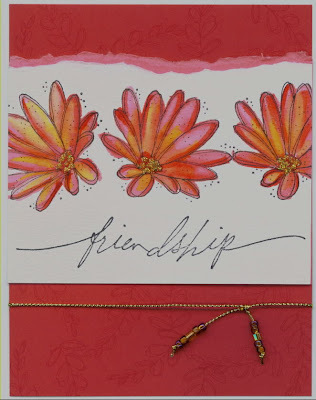 I was in a swap with some of the most talented stampers on the planet, so mine had to be GOOD! I loved how this turned out & it's super easy! You take 2 large envelopes and cut the flap off one of them. Then you slide the flap from the 2nd envelope inside the other and glue it down. You end up having a little folder with 2 side pockets. I then made a card and a matching medium envelope to go inside those pockets. Once the folder is decorated, tie it closed with a ribbon. The card below is another one I made with this cute set. It's still a set that I can't seem to part with, even though I don't use it very often. Vacation Update: So where are we today? Today we will board the Royal Caribbean ship Grandeur of the Seas and leave Norfolk, VA around 4:00 pm. We are all looking forward to some R & R.
Just a quick reminder that I'm on vacation so I'm sharing some of my favorite projects from the past. 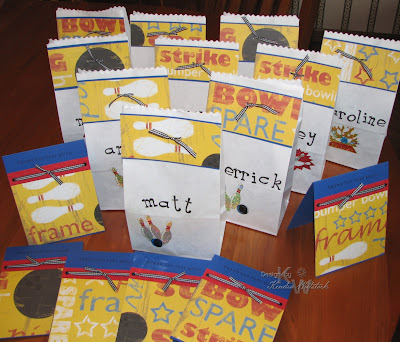 These were all made with the old Stampin' Up! set In Full Bloom. The perfect set for watercoloring or using my Prismacolor Pencils. Vacation Plans: I guess I haven't really shared any of our vacation plans with you. Tim's parents will be celebrating their 50th wedding anniversary on June 15th. They decided that the only thing they really wanted was to take their immediate family (3 sons and families) on a trip. 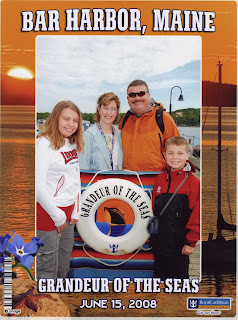 So on Friday, we will leave on a cruise ship and sail from Norfolk VA to Bar Harbor Maine; St. John New Brunswick & the Bay of Fundy; Halifax, Nova Scotia; and our final port of Boston. We left Indiana yesterday, and are on our way to Norfolk. But before we get there, we are planning a quick side trip to Washington DC. I can't wait to see the kids reaction to this great city today. Everyone should make a trip to our Nation's Capitol. Later this evening, we will meet up with the rest of the family at a hotel in Norfolk to begin the celebration. Today we are leaving for vacation and even though I've been working non-stop on new creations, I thought I'd take this opportunity to bring out some of my favorite projects I did BB (Before Blog). 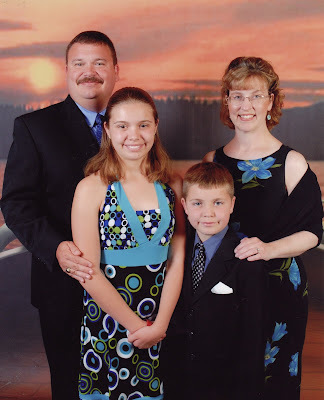 In 2006, my husband and I faced some of the most trying times in our lives because of my cancer diagnosis. We are so fortunate that this brought us closer than we had ever been before. Now that's really saying something because we've been together since we were 14 years old and we were friends a few years before that! Anyway, on our anniversary, I decided that I needed to make him a special gift. I thought and thought about it and finally decided to make this book of our life together. I was thrilled with how it turned out & I made my sweet husband cry! Right: A place for a hidden note! I'll share more of our vacation plans & what we are up to in the upcoming posts. Happy Birthday Matt! Today is my son's 9th birthday & I just can't believe my baby is that old! When did that happen? 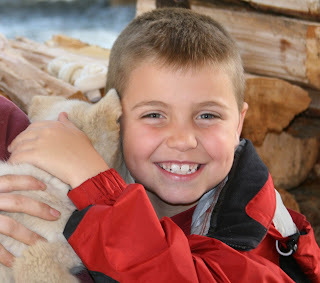 The photo of him was his birthday last year when we went dog sledding in Juneau ~ what a birthday that was! This year we've had just as much fun. 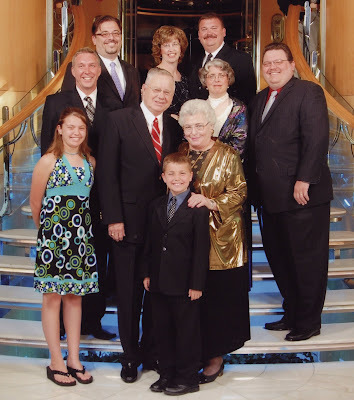 We just got back from a birthday trip to Cedar Point and tomorrow we leave for a cruise vacation with my husbands whole family ~ we will celebrate my in-laws 50th wedding anniversary. 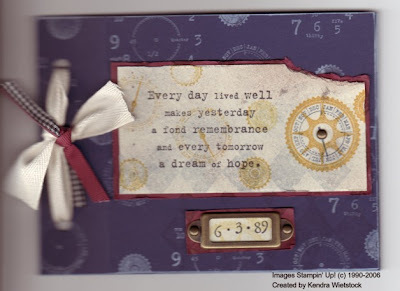 Supplies Used: Stamps ~ Lizzie Anne Designs; Cardstock & Pattern Paper ~ Doodlebug Designs; Ink & Ribbon ~ Stampin' Up! I just HAD to do something with this cute paper! It's called Chick-A-Doo from SEI & it's just so darn cute. I looked and looked for stamps in my collection that I thought would coordinate with this paper, but since it's a pretty busy pattern, I didn't want to add more. Sometimes less is best. Supplies: Stamps ~ Lizzie Anne Designs (Alphabets); Cardstock ~ Papertrey Ink; Pattern Paper ~ SEI; Scallop Scissors ~ Fiskers; Punches & Ribbon ~ Stampin' Up! ; Brad ~ SEI; Ink ~ Palette. I love to read, but I never get enough time to do it. Actually, I am the Library Director for our church. 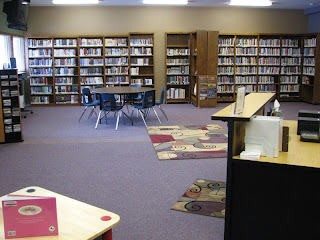 I know what you're thinking... a church library is usually a bookcase or a rolling cart of books. Well not this one! We have almost 7,000 pieces in our library and it has VERY current materials! 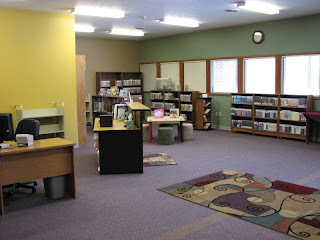 We are even fully automated with a bar code system and a second computer so patrons can search for materials! 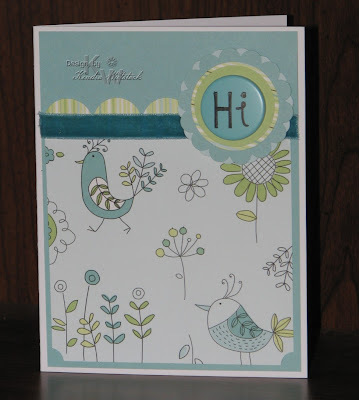 Supplies Used: Stamps ~ Hanna Stamps (Bookworm) & unknown (oval); Cardstock ~ Stampin' Up! ; Pattern Paper ~ American Crafts; Ink ~ Palette & Copics; Brads ~ Doodlebug. Can't you just see a Starbucks gift card in this? Perfect for all those coffee drinkers in your life or how about a teacher. I just love this set & this paper is so fun & retro! 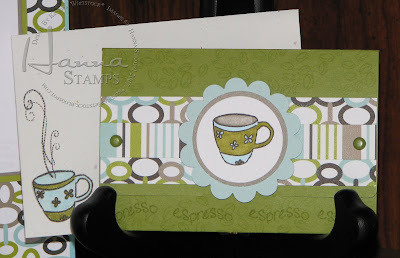 Supplies Used: Stamps ~ Hanna Stamps (Cafe); Cardsock ~ Stampin' Up! 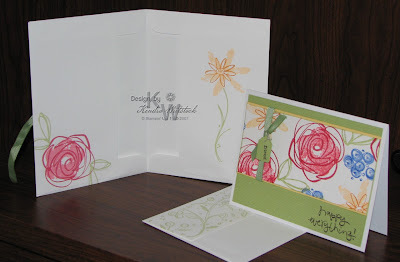 ; Note Card and envelope ~ Stampin' Up! ; Pattern Paper ~ American Crafts; Punches ~ Stampin' Up! 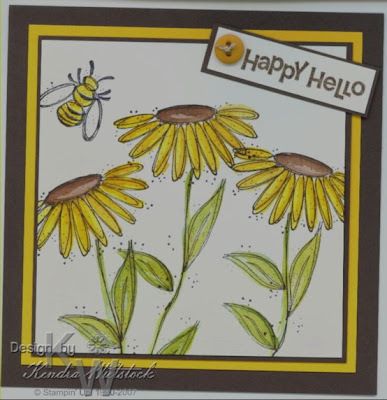 ; Ink ~ Stampin' Up!, Copics & Palette; Brads ~ Doodlebug. Oops! Some of you might have seen this last Friday ~ I had the wrong week for the challenge. 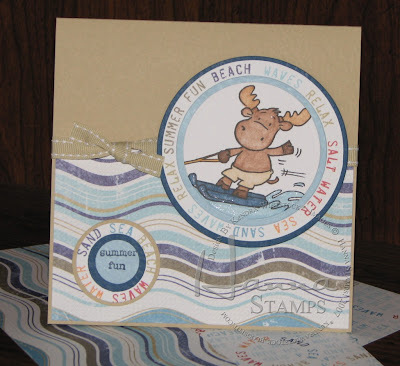 SO TODAY over on the Hanna Stamps forum at Splitcoast Stampers, Michelle issued a circle challenge. I just found this cute paper by Creative Imaginations at the local scrapbook store and couldn't wait to use it. The words are actually pattern paper & I just found the right size Nestability die & circle punch to cut them out. I was pretty excited when I saw this actually worked! The new sets ~ Bookworm, Cafe & Anthony, are all available over at Hanna Stamps today! Supplies Used: Stamps ~ Hanna Stamps (Riley Collection); Cardstock ~ Prism; Pattern Paper ~ Creative Imaginiation; Ink ~ Palette & Copics; Ribbon & Circle Punches ~ Stampin' Up! ; Nestibility dies. A few weeks ago, I drew up more card ideas and put them in my sketch book (I just love that thing). When I went to make some cards, I knew I wanted to use the new golf clubs from the Anthony set by Hanna Stamps, so I went ahead and just made 3 different layouts and then added the stamped images later. 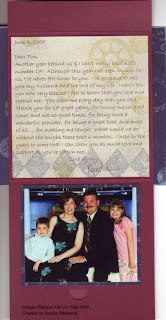 One card I am using for a Father's Day card & the other two will be for birthday's. It's always nice to have a stash of guy cards available. ...FLOOR! Although, I would probably be on the floor after just one or two! 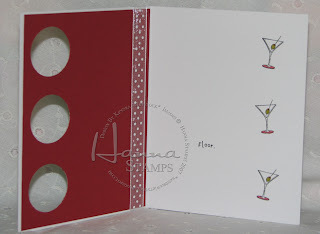 This cute little martini glass is part of another new Hanna Stamps set coming out this Friday, June 6th which is called Anthony. Supplies Used: Stamps ~ Hanna Stamps (Anthony) & The Cat's Pajamas (sentiment); Cardstock ~ Papertrey Ink & Prism; Ink ~ Palette & Copics; Ribbon ~ May Arts; Circle Punch ~ Stampin' Up!